Download the full paper here (pdf, 900 KB). Download the full paper here. FENSA - a fence against undue corporate influence? Download the Working Paper here. Download a German summary here. For single chapters, please see here. Published by Eurodad/Global Policy Forum et al. Download the full report here (pdf, 7,8 MB). Download a short version here (pdf, 6 MB). Download here (pdf, 590 KB). Download here (pdf, 800 KB). Misdirecting finance – who benefits? The New Alliance for Food Security and Nutrition in Africa: Is the initiative by the G8 countries suitable for combating poverty? 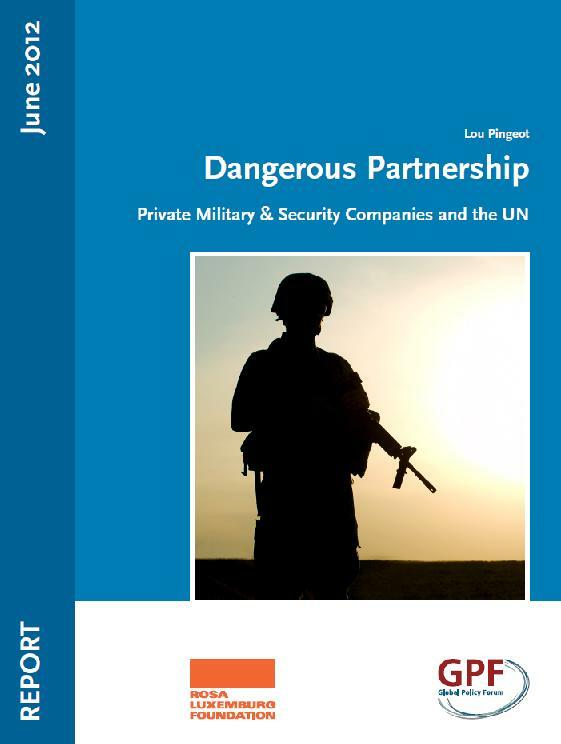 GPF’s investigative report examines how the UN has dramatically increased its use of these companies in recent years, hiring them for a wide array of “security services” and giving them considerable influence over its security policies. An executive summary of the report is also available here. For more information on the report’s reception, including responses from PMSCs and the UN, click here. The executive summary of the report is published by the Friedrich-Ebert-Stiftung in its International Policy Analysis series (June 2012). GPF and other NGOs sent this open letter to Harvard University to urge it to reconsider its institutional investments in land grab deals. The letter questions Harvard’s participation - along with other universities, public sector pension funds and charitable foundations- in a three day conference in New York City on “Global AgInvesting.” A similar letter was sent out to Princeton and Yale. In early May, we received aresponse from Yale President Carl Levin. With endorsement by the Security Council, a powerful multi-national fleet of warships patrols the seas off the coast of Somalia to protect the shipping lanes from local pirates. But neither the Council nor the naval powers address other serious crimes in these waters – foreign illegal fishing and the illegal dumping of toxic wastes. This GPF special report looks at how the fishing and dumping is related to the piracy and how the Security Council systematically ignores these issues, calling for further “studies” while ignoring the ample evidence. The authors call for a coast guard to replace the warships, for immediate action on the fishing and dumping scandal, and for far stronger global regime to protect the world’s seas from abusive, criminal activities that harm coastal peoples. Today’s global economic crisis has been preceded by a history of constant, systemic instability. This timeline, created by Global Policy Forum’s Anahi Wiedenbrüg and Alexander Post, shows a forty year record of disequilibria, meltdowns, panics and other forms of crises, beginning in 1970. The picture it provides is of crises as a norm – far from the “equilibrium model” ordinarily taught in economics classes. There appear here, in this on-line presentation, the collapse of major firms, extreme currency speculation, real estate and financial bubbles, Ponzi schemes, and stock market meltdowns, sometimes harming hundreds of millions of people. The reader can see that as markets have become more global and as regulations have been abolished, the system has become more prone to devastating crisis on a worldwide scale. In: Friedrich Ebert Stiftung, International Policy Analyis. Dialogue On Globalization. GPF Europe and the Foundation for Environment and Development North-Rhine-Westphalia hosted a panel workshop at the ACUNS Annual Meeting 2008 in Bonn on ”The Future of Civil Society Participation at the United Nations”. The following documentation contains the papers by Tanja Brühl, Jan Aart Scholte and Christer Jönsson presented at the workshop. Jens Martens /Tobias Debiel: MDG Project in Crisis. 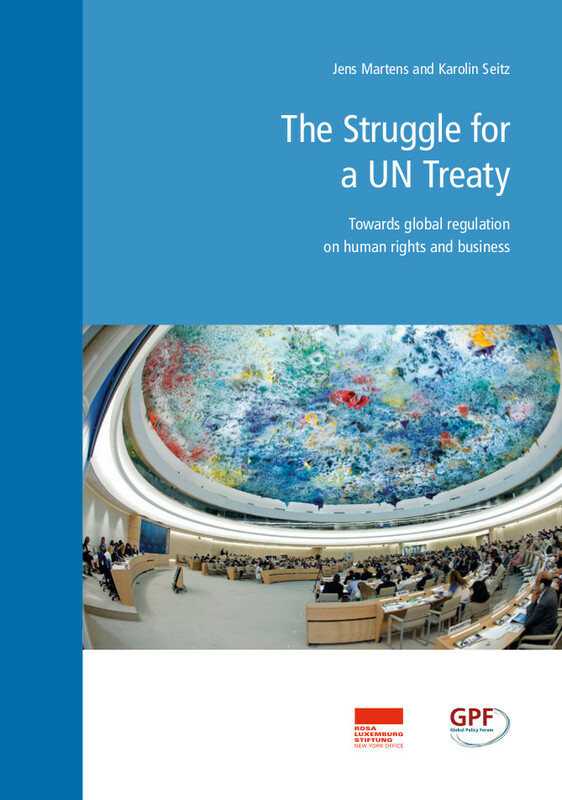 Global Policy Forum's Jens Martens gives a critical analysis of the 2008 report by UN Special Representative for Business and Human Rights John Ruggie – "Protect, Respect and Remedy: a Framework for Business and Human Rights." Martens calls the report "a description of the status quo" that does not leave the door open for developing new ideas on international law and corporate responsibility. Martens offers concrete steps, based on Ruggie's recommendations, towards increasing corporate accountability, such as creating an International Advisory Center, using Security Council sanctions and strengthening national complaints mechanisms. On April 28, 2008 the Security Council will discuss Iraq and receive a report from the US on the Multinational Force (MNF). In anticipation of this debate, Global Policy Forum and International Federation for Human Rights call for greater attention to the extrajudicial and arbitrary detention of large numbers of Iraqis held by the MNF, including some 20,000 held in a vast prison camp in the southern desert. This Global Policy Forum report critically reviews the global food aid system. Author Katarina Wahlberg argues that food aid donors fall short in prioritizing the needs of the poor and hungry. Instead, donor countries use food aid to promote their own national strategic and commercial interests. Such food aid not only fails to reduce hunger, it can also harm long-term food security in recipient countries. The UN mandate authorizing the Multinational Force in Iraq is up for renewal in late 2007. In this memorandum, Global Policy Forum argues that the Security Council should not renew the mandate. The memo recalls the many ways that the MNF violates international law and human rights. It points out that the political and humanitarian situation in Iraq is worsening and the great majority of Iraqis see the MNF as an occupying force that prevents national reconciliation. The Iraqi parliament has called for a withdrawal timetable and insisted on its right to ratify any MNF renewal request. A renewal would weaken the UN, promote a US protectorate in Iraq, and damage security in the Middle East region. In late 2007, the UN Security Council will consider renewal of the mandate that authorizes the presence of the US-led multinational force (MNF) in Iraq. Global Policy Forum outlines the little-known demands of the Iraqi parliament to ratify any new agreement on the MNF. The Iraqi constitution requires the cabinet to submit such agreement for ratification and the parliament has already passed a law demanding conformity with this provision. A majority of parliamentarians also wrote a letter to Security Council members about the matter, calling for a timetable for MNF withdrawal. If Prime Minister al-Maliki again submits a request to the Security Council without parliamentary approval, a constitutional crisis in Iraq would surely follow. GPF argues that the Council should take into account the concerns of the parliament and of the great majority of the Iraqi people, so that a withdrawal plan can be set. Since the March 2003 invasion, the US-UK occupation of Iraq has utterly failed to bring peace, prosperity and democracy, as originally advertised. This major report assesses conditions in the country and especially the responsibility of the US-led Coalition for violations of international law. In twelve detailed chapters, brimming with information, the authors provide a unique and compelling analysis of the conflict, concluding with recommendations for action. Among the topics covered are: destruction of cultural heritage, killing of civilians, attacks on cities and long-term military bases. 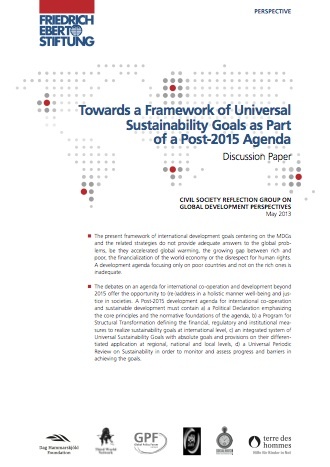 The report has been written and produced by Global Policy Forum and co-sponsored by thirty NGOs. This Global Policy Forum-Friedrich Ebert Foundation joint paper analyzes how UN relations with NGOs as well as the corporate sector affect international policymaking and multilateralism. The author, GPF-Europe's Jens Martens, warns that "despite the image of greater flexibility and efficiency," such partnerships could increase businesses' influence in politics while impeding long-term development strategies. Martens therefore calls for a system to regulate the UN's interaction with corporations, ensuring that profit-driven initiatives do not overshadow public interests. Jens Martens: Multistakeholder Partnerships–Future Models of Multilateralism? A group of NGOs, including Global Policy Forum, has submitted a letter to the General Assembly President calling for improved NGO access and participation at the UN. The list of ten recommendations includes access to the new Human Rights Council, Peaceuilding Commission and the General Assembly, as well as better support for NGLS and the appointment of a high-level person on NGO affairs in the Executive Office of the Secretary General. The text emphasizes that while NGO hearings by UN bodies may have a value, they should not be used "as a fig leaf to conceal the lack of more extensive forms of NGO participation." A US-backed spending cap threatens to put the UN in a financial crisis by July 2006, unless the organization implements management reform. This report summarizes the high-level discussion on "The Challenges of UN Finance," organized by Global Policy Forum and the Friedrich Ebert Foundation. The meeting brought together NGOs, UN officials and diplomats to share information, discuss key issues, and consider action to strengthen the UN's finances and head off the crisis. In this contribution to the 2006 Social Watch Report, Jens Martens of Global Policy Forum calls for a "paradigm shift in the international discourse on development financing." Martens draws up concrete policy recommendations to enable poor countries to mobilize "enough domestic resources to guarantee universal access to reasonable quality essential public goods and services." Presently, a tax "race to the bottom" in attracting foreign investment, ineffective tax administrations, and pressure towards tariff reductions deprive poor countries of billions of dollars in potential income every year. In addition to tackling these income challenges, policies must ensure poor countries spend less on debt service, harmful subsidies and military budgets. 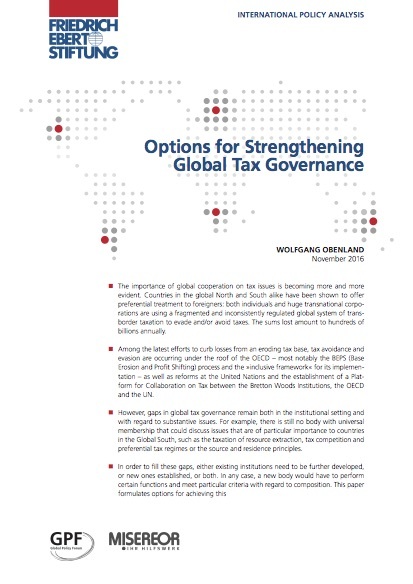 In recent years, political leaders and influential institutions have taken important steps toward global taxes, and have succeeded in making the topic less of a taboo in international relations. 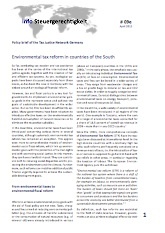 While welcoming these developments, Katarina Wahlberg of Global Policy Forum argues that the recent high-level proposals neglect the vital role global taxes can play in steering global environmental and financial policy. Moreover, these proposals fail to guarantee that the tax revenue will be additional to Official Development Assistance (ODA) and spent in a democratic way to finance real development. Jens Martens: A Question of Political Will. This Global Policy Forum and Friedrich Ebert Foundation Briefing Paper examines Secretary General Kofi Annan's UN reform agenda and notes that "for some, the initiatives are not sufficiently far-reaching, [yet] others view them as too radical and unsuitable to implement politically." The paper criticizes Annan for his weak stance on alternative development financing, including global taxes on currency transactions. It also draws attention to the need for greater civil society participation in the preparations for the Millennium+5 Summit in September 2005. Jens Martens: UN Reform and the Millennium Goals 2005. Opportunities for New Initiatives in Development Finance and Global Governance? After more than two years of work, the United Nations Millennium Project published its final report, "Investing in Development," in January 2005. This Global Policy Forum and Friedrich Ebert Foundation briefing paper provides a more accessible analytical summary on the massive report and places it in a political context. This open letter by Global Witness, World Vision and Global Policy Forum calls on the Panel to consider how natural resource exploitation fuels conflict worldwide. The letter urges the UN to create a working definition of "conflict resources" and to establish a Secretariat office or permanent inter-agency task force on natural resources issues. Global Policy Forum's Céline Nahory argues that the decline in number of vetoes in recent years is deceptive. Permanent members continue to pressure the Security Council through the "hidden veto" - the quiet threat that they may use their veto power. Offshore financial centers provide secret havens for money laundering and tax evasion. In this Global Policy Forum policy paper, Jason Garred pierces the veil of these mysterious places, showing how they provide services for corporations and wealthy individuals, enabling escape from onshore tax and regulatory authorities. Garred shows that offshore centers exists with the complicity of major money-center governments and banks. They assist criminal activities, pose serious problems of international financial stability and undermine long-established tax and social welfare systems. This article details the growing engagement of NGOs with the UN Security Council in the period after 1990. As the Council grew more active, NGOs began to seek out Council members and argue for better policies. Global Policy Forum took the lead in setting up the NGO Working Group on the Security Council in 1997 with the help of forward-looking ambassadors. Some positive results have followed, but great power interests set firm limits to what NGOs can achieve. The US dollar has dropped dramatically against the Euro in 2003, but few analysts point to the shaky economic fundamentals spelling trouble for both the dollar and for the US economy. This Global Policy Forum paper takes a critical look at the soaring US trade deficit and possible global implications of the dollar's decline. 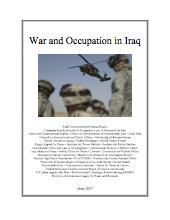 A comprehensive report on UN sanctions against Iraq, issued by Global Policy Forum and eleven NGO partners on the twelfth anniversary of the original sanction resolution in the Security Council. The report discusses sharp differences in the Council over the sanctions, issues in humanitarian law, and the battle for the future of Iraq's oil riches. Letter from Anne Walker, Executive Director of the International Women's Tribune Centre, describing her problems while attending a meeting at UN headquarters. 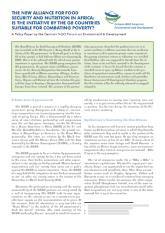 A background paper by Harold Paine and Birgit Gratzer on the organization of the Reverend Sun Myung Moon seeking a major role in the NGO community at the United Nations. This paper, by Rainer Falk and sponsored by WEED, Global Policy Forum and the Heinrich Boell Foundation, focuses on the renewal of tasks and institutional structure. It concludes that the IMF needs to be both strengthened and weakened, depending on the Fund's future role. The paper was presented at an NGO Strategy Workshop in Washington, October 2001. A discussion paper for the United Nations for Development Process by Jens Martens of Global Policy Forum Europe. Phyllis Bennis from the Institute for Policy Studies reviews what we know - and what we do not know - about the emerging Bush strategy toward Iraq, including the divergences between Powell and Cheney. Global Policy Forum's Jason Garred presents a general introduction to NGOs, and then looks at how NGOs can influence the murky world of transnational finance. Global Policy Forum takes a position on corporate power and the battle over global public policy at The United Nations. In this essay, Global Policy Forum's Director James Paul considers unusual aspects and special problems of these micro-members of the international community. An analysis by Global Policy Forum's Director James Paul, provides historical background and emphasizes NGOs growing contemporary importance, diversity, impact on policy, etc. A speech by James Paul, Executive Director of Global Policy Forum, reviewing the changing relationship between the U.N. and the Bretton Woods Institutions and calling for new ways of making those institutions more responsive to democratic processes. Written by James A. Paul and Senwan Akhtar of Global Policy Forum. A policy paper by James Paul (Global Policy Forum) and Jens Martens (WEED) that seeks to outline the recent trends of financing for development and to formulate a few recommendations for further studies and activities of the UN. Brief introduction for those unfamiliar with the issue of global taxes and charges by Kevin Baumert of Global Policy Forum. Major analytical paper written by Kevin Baumert of Global Policy Forum. James A. Paul of Global Policy Forum made these recommendations at a forum of German parliamentarians in Bonn on March 31, 1998. By James Paul, Executive Director of Global Policy Forum. An analytical essay written by Global Policy Forum Executive Director James A. Paul. Prepared by Global Policy Forum and the World Federalist Movement-Institute for Global Policy for a meeting between NGOs and Delegations. Comments by Nigerian Ambassador to the UN Ibrahim Gambari to a meeting of Africa Amicale at UN Headquarters. Published jointly with the Council on International and Public Affairs, a substantial document issued in 1996 that outlines human rights claims to protect people from industrial pollution, toxic wastes, and the like. Inspired by tragedies like Bhopal and Chernobyl. Written by James Paul of Global Policy Forum. Statement made to ECOSOC by James A. Paul on behalf of ISMUN, Global Policy Forum, WEED, and the World Federalist Movement. World Federalists of Canada issued this Briefing Paper which provides a history and analysis of the crisis and calls on the Canadian government to support alternative funding for the UN. A major policy paper published jointly with WEED of Germany, showing how the World Bank under Wolfensohn continues to grossly disregard the environment in its headlong race for privatization and profits. A brief analysis by James Paul, Executive Director of Global Policy Forum, about the relations between the World Bank (and other International Financial Institutions) and NGOs. Ambassador Nabil Elaraby of Egypt considers the Security Council and nuclear weapons issues at a meeting of the NGO Working Group on the Security Council. Speech by Lucy Webster delivered at the NGO Working Group on the Security Council. By Dr. David Krieger, President, Nuclear Age Peace Foundation. Chilean Ambassador to the UN Juan Somavía speaking at a meeting with the NGO Working Group on the Security Council. 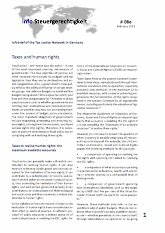 [published jointly with WEED] Statement by German Non-Governmental Organizations on UNCTAD IX. Speech by Erskine Childers delivered at a "Conference on The Fate of Democracy in the Era of Globalization" organized by Wellesley College Department of Political Science, Campaign for Peace and Democracy, Global Policy Forum and United Nations University. Together with the Geneva-based International NGO Network on Global Governance, Global Policy Forum organized a conference on Security Council reform.